Corals first appeared on earth nearly half a billion years ago during the Cambrian Period of the Paleozoic Era. The ancient Greek philosopher Aristotle categorized corals as zoophyta, or “plant-animals”, due to their plant-like appearance. Closer examination of corals revealed that they are not plants at all, but instead belong to a group of animals called cnidarians, which includes sea anemones and jelly fish. Corals are generally immobile and colonial; the plant-like structure of corals is actually a colony of multiple coral polyps. Each coral polyp is an individual animal with its own tentacles, digestive filaments and mouth. All animals begin their lives as fertilized eggs. From there, the egg divides and eventually forms a blastula, or hollow single-layered sphere of cells. Then, the embryo becomes multilayer of cells through the dynamic cell movement process called gastrulation. Each of the embryonic layers are responsible for the formation of specific organs and tissues within an animal. Two layered animals, or diploblasts, contain an endoderm and an ectoderm from which all body structures are derived. Triploblasts, such as humans and insects, contain three layers. In triploblasts, the endoderm is comprised of the innermost internal organs such intestines and lungs, while skin and epithelial tissues form the ectoderm. The mesoderm includes bone, muscle, cardiac tissue and blood. Each layer is formed by interactive functions of various genes during early development. Because corals are one of the most primitive and successful cnidarian group, they are useful for understanding animal evolution. The OIST team studied the function of the brachyury gene in Acropora digitifera, the most common coral in Okinawa. “This study was achieved on the basis of the availability of corals in Okinawa, careful planning of experiments, and the amazing DNA sequencing facilities at OIST. Because the annual spawning day of corals is unpredictable and the quality of eggs is different each year, it took five years to obtain the results through trial and error.” Dr. Yuuri Yasuoka explains. Researchers at OIST have previously decoded the Acropora genome, making it suitable for these studies. However, because Acropora eggs float on sea water, it is difficult to manipulate them. To overcome this problem, the Dr. Yasuoka developed a method to retain the eggs between glass materials by surface tension (Figure 1). This allowed the scientists to then use microinjection to insert a material that inhibits the brachyury gene into Acropora eggs and examine the results of this inhibition in coral embryos. 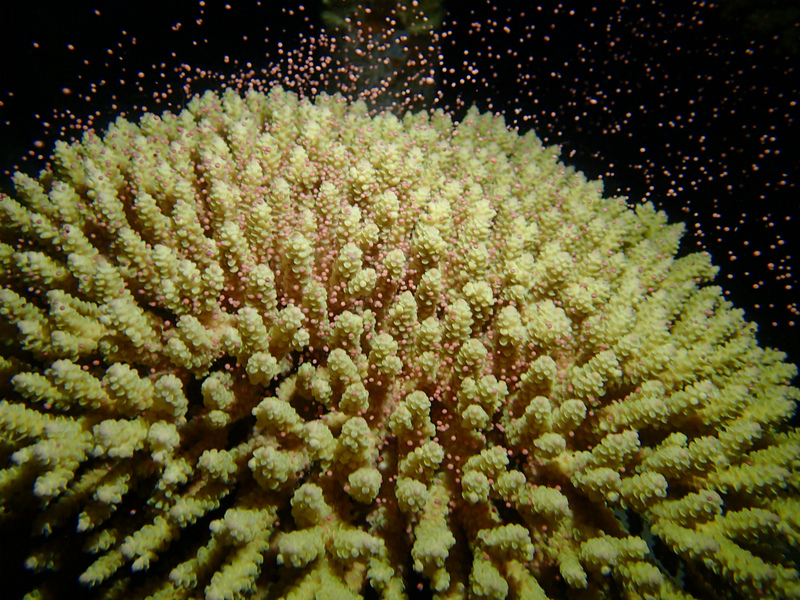 Figure 1: New technology allows for microinjection experiments using Acropora eggs. Dr. Yuuri Yasuoka developed a method to study Acropora eggs by using glass capillaries attached to a glass slide to trap the eggs when water is slowly removed. A small amount of water remains in the space between the glass pieces and immobilizes the eggs due to the surface tension of the remaining amount of water. Figure 2: Corals lose their mouth structures when brachyury is inhibited. 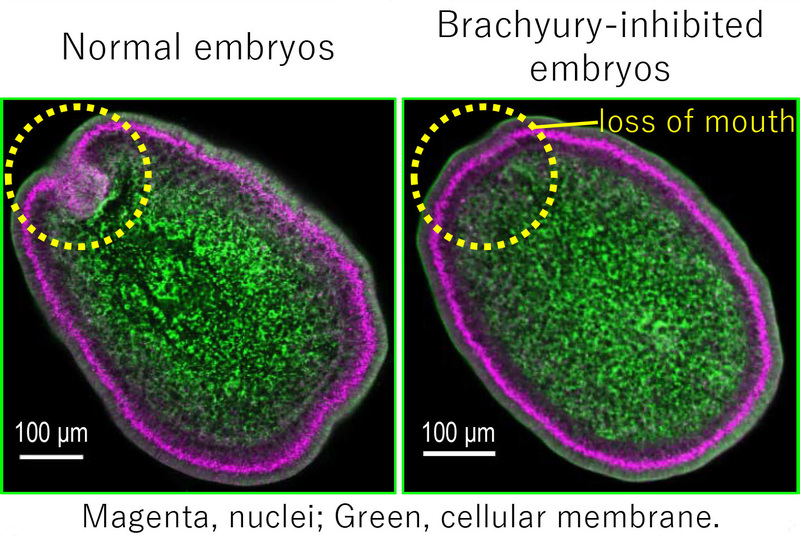 This figure depicts a coral embryo with fully functional brachyury on the left and a coral embryo containing the inhibited gene on the right. The yellow circle shows the area where the mouth structure is expected. Prof. Noriyuki Satoh, leader of the Marine Genomics Unit, further explained: “One of our unit’s research topics is to explain evolutionary processes of animal body plans at molecular levels. The finding that brachyury plays a role for blastopore formation during coral development has very high impact because corals lack a mesoderm and brachyury functions to form the mesoderm in vertebrates. We will continue to investigate brachyury functions in various animals”. Further studies using corals are warranted to answer more scientific questions. Corals play a vital role in the marine ecosystem, making them an important animal to study. “Coral reefs are crucial to supporting the biodiversity of the earth and also possess economic values for fishery and tourism. While the whole genome sequence of a coral species was decoded previously, the molecular basis of the coral ecosystem remains unknown. To find real roles of coral genes, we have waited for coral spawning every night. This study marks a huge progress in the study of corals and hopefully contributes to preservation of corals in future”, revealed Dr. Chuya Shinzato.